-Some basic HLSL shaders would probably be fun (a geometry shader might be in there at some point too...although they are annoying...) probably basic diffuse, specular, normal mapping maybe some cube mapping. -If I get the time I still want to finish developing my GUI for an inventory that would use some STL containers to make it switch between two "packs" etc. Again, maybe some other topics people suggest. I guess one of the projects besides my Exam Game that I'm making is a project I am starting tonight actually. 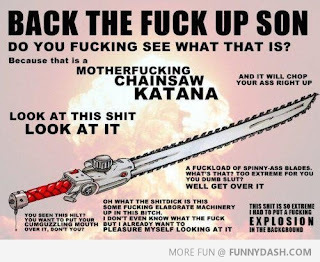 It's based on this image that is floating around the web currently...The Chainsaw Katana. So I started modeling this in 3dsMax a lil while ago. I have the very bottom of the hilt done (had some issues on how I wanted to make it look compared to the picture so had to do it a few times before I was happy with it.) and a basic blockout of the hilt part (still debating on whether or not I should model the braids or just nDo it and then use the Normal Map for the textures as well (think in the long run it will be easier. This is my project for giving me a much needed break from actual programming (still have to read my theory but hey, it's a work in progress). Well thanks for reading, I'll probably add pictures later or in the next post. Here's the first WIP pic, just the hilt (haven't made the pull cord on the bottom or whatever the side circle thing is) gonna have to find some ref of chainsaws I think to make the next big piece believeable.